Reading the back issues of Wired this weekend, I stumbled across an article on the Glassic Soho: affordable, efficient, and ready-made. 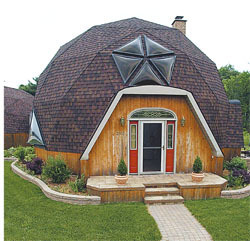 But, I’ve always liked the aesthetics of a dome, which is the perfect space for one or two people. 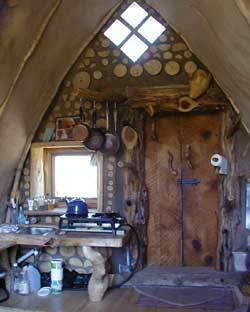 My dear friends have lived in a geodesic dome on a NM mesa for over 20 years. And then there are earthships. They’re not that cheap, but it feels great to live in one, as I once did for about a year: it's like living in a womb, and it stays warm all winter, even without lighting a fire.The best place to learn more about them is Earthship Biotecture. Until I have the time and the funds, however, I might just have to find another non-traditional way to put up a roof. your postings make my day and take me to a different and lovely place!! there was a great article in the ny times about these tiny houses a few months ago-- check them out-- and imagine one of these in the new mexico sunset! Hey, I'm glad to check you out and see that you are still thinking in the terms of settling...here right? We've all sort of been wondering what your plans are. If you find the right builders, you can build something affordable. Those tumbleweed houses are really cool but really tiny. Shay Solomon, the builder of the vault, put out a great book with Nygel called Small House on a Tiny Planet. It's a great read. Maybe you're not trying for a tiny house but it still gives good ideas. Hope to see you in a few months when you hang your hat here. Thanks for the link, Legend, and for the book suggestion, Datta. I heard that Shay and Nigel finally published their book: i knew they had been working on it. I don't plan to live full time in NM for a long time, Datta, but i do want to build a home so that when i visit in the summers I have a place to stay. Good to hear from you guys!